EuroLive.com - European models waiting to entertain and be entertained! To begin with, EuroLive.com has several languages and is predominantly set in French, so be sure to set your preference (so that you can understand fully) by clicking the country icon at the top left corner of the screen. Next to here, is an important preference option and if you are looking for ‘Gay’ or ‘Trans’ fun, you can change the site’s selection. Also, you are advised to turn off your adblocker if you use one, as to ensure you can use all of the site’s features. On the Home screen, you will see that you have search options as well as live models to choose from. Some of these galleries or photos will be free to view (and this is indicated in green at the bottom of the icon). However, some of the models will charge a fee in coins (and this is indicated in pink along with the price at the bottom of the icon). 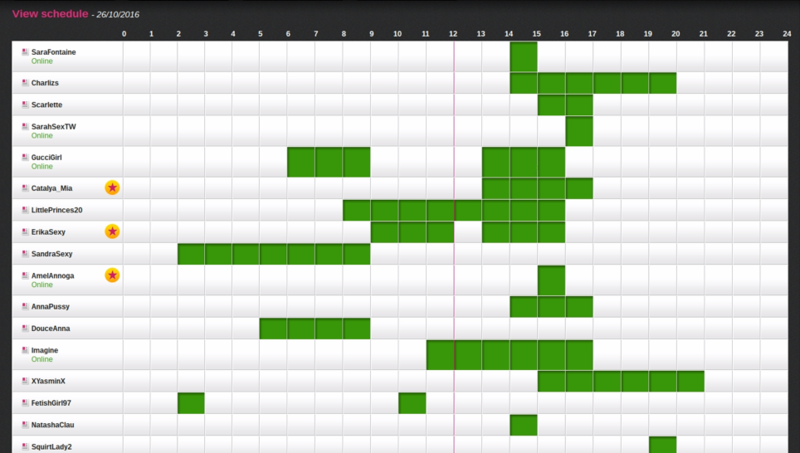 The ‘Schedule’ option, will show you the planner and so you can keep up to date with when the models intend to be online. The ‘Notifier’ is an especially helpful tool that allows you to ensure that you receive a message to let you know when your favorite models login in, so that you never miss them! These notifications appear on your screen and grant you access to that specific model, without even having to open the link in your browser! If you wish to see the mobile app, simply click on ‘Mobile’ and this will open a new window which will allow you to view the platform in its simplified manner. ‘Contest’ is a feature that allows the models who have received the highest amount of tokens to be ranked to the top of the list and receive an added bonus from the site. You can participate and ensure that your favorite model wins by tipping. Those Supreme members who tip, the donation will be counted as double and so that allows your model a better chance of winning! When you enter a cam to check out what is going on, you will see the show to the left and the chat box to the right. At the bottom of the screen there are small icons of the other cams which are currently broadcasting, so if you wish to switch and browse further, find out what is going on in a different room, then you can do so easily. However, in order to participate and interact with the conversation, you are required to first sign up. If you try to write your message, a small box will appear on the screen asking you to quickly fill in certain details. You must have a valid email address and think of a username and password. Once you have signed up, you may resume to the site and browse as a fully fledged member! As easy as that! When you revisit the Home screen, you will notice a welcome note from the site in the top right hand corner. 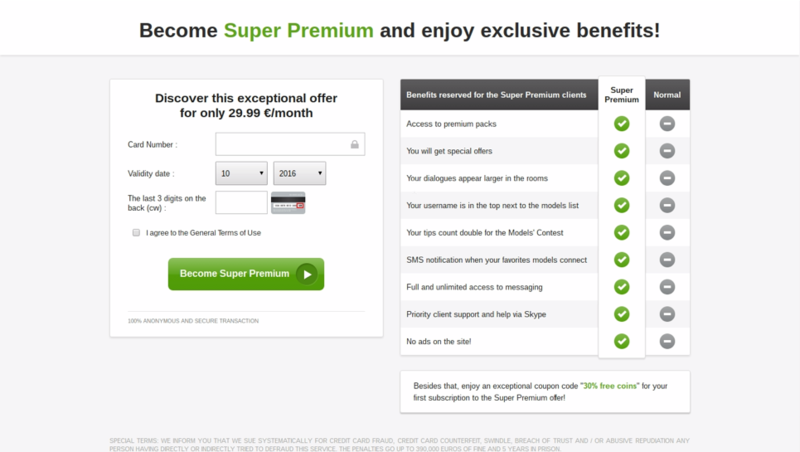 Underneath, is the option to ‘Become Super Premium’. Clicking here will take you to a new tab that will indicate all the benefits of paying the fee to upgrade your account. Things like, having access to ‘Priority support via Skype’ as well as extra features for your interaction and tips made to the models. However, there is only the option available to pay by card and this limits a lot of people. 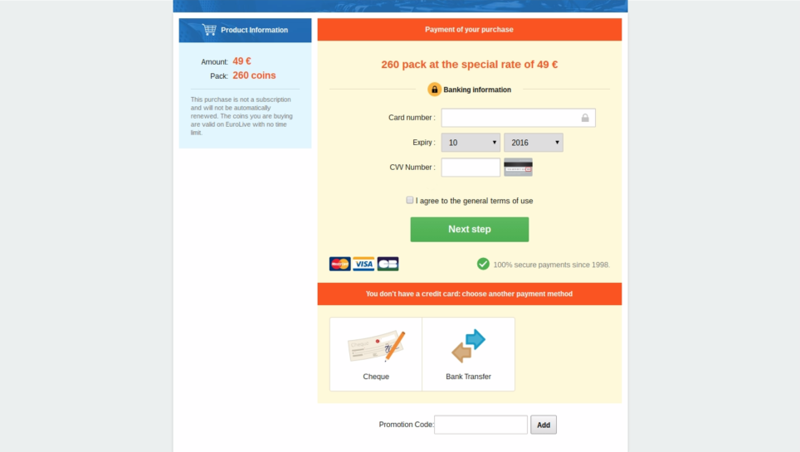 If you want to proceed as a paying member, there are four different packs that you can choose from. Initially, the site will ask you to enter your bank information, but at the bottom of the screen you may change your payment method if you prefer. Once you have chosen your package, completed your payment method and stocked up on coins, you can go ahead and resume the show. You may pay your model tips and show her your appreciation or you may go a step further and treat the pair of you to a private show! Viewing the profile of your chosen model, will open up in a new window. You will be able to read about what they like, a little about their personality / appearance and features as well as see their photographs. If you wish, you can ‘Start private with Cam-to-Cam’ and private sessions are 16 coins per minute. The models are all wonderful in their own way, there are plenty of options with regards to your personal preference. There is definitely something for everyone here and the prices are extremely fair for the quality.